A: It is unclear the length of time she has had hairballs and the previous types of food she had before Royal Canin. Also since she is 3.5, at what age she began carpet licking. Have you seen her licking the carpet? You mentioned you never see her throw up a hairball, so presumably you find them. I’m unsure how you assessed or determined that she licks the carpet before and/or after coughing up hairballs and the length of duration between the two. I imagine if she was licking that much carpeting, she might get sick and you would see carpet in vomit or stool, especially if she was eating enough carpet to do damage. Was she also scratching the carpet? Here are some things to consider. If she is actually licking the carpet and you have seen her and she is still doing it, question if there are any odors or scents on the carpet from previous tenants, pets, food by giving the carpet a good vacuuming and maybe steam cleaning (but without any chemicals). Make sure to take her to the veterinarian to rule out medical issues. Request blood work to begin. Often forms of Pica are due to underlying medical problems. Look into changing her food and the types of food she is eating, along with increasing her water consumption. Most pet foods are filled with by-products and cheap fillers. 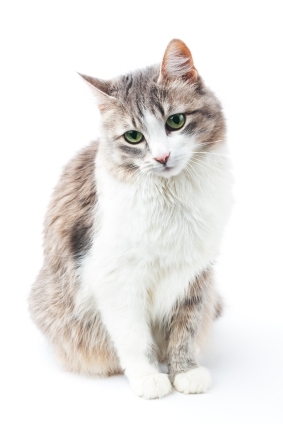 Often times, cats fed very poor all dry food diets have more problems with hairballs. Very poor quality, stinky wet foods can also cause cats to vomit immediately after eating. By upping the quality of cat treats, wet food (and dry), and/or adding or preparing homemade diets for cats (consult with a holistic veterinarian), and by increasing or encouraging more water consumption, hairballs can decrease considerably. Adding a large ceramic water bowl or fountain away from food is a good place to begin. Cats prefer to drink and eat in separate locations (see Tips to Have a Happy Cat). Most cats when they are fed higher quality food and meats, and when they consume more water, shed less and vomit less. Giving them some greens to eat can also help. Cats prefer meadow grasses and lawn grasses, such as crab grass (just make sure the lawn is not chemically treated with toxic insecticides) over wheat grass or ‘pet grass.’ Adding probiotics to her diet may also help with digestion. To help prevent or lessen excess hairs from shedding, brush her with a very soft bristled brush or a small flea comb. Small flea combs can be great for removing excess hair. Then take a damp wash cloth or paper towel and stroke her along her back, body and face. The damp paper towel will also remove excess hairs that the comb missed. These would be the steps I would take to begin working on the problem. Alana Stevenson can be contacted through her website. She provides consultations by phone and Skype. and was told to get a soft toy to put between her mouth and my hands and it worked VERY well. Our play was very pleasant after that.